When I'm at my desk, I would like to use only the external display. This used to be a piece of cake with Snow Leopard and below - you plug in the external display, close the lid, plug in a USB device or press a key on a connected keyboard to wake the machine, and once it's woken up and using the external display reopen the lid and the internal screen stays off. Unfortunately, Lion detects when my MacBook Pro is open and thinks its being helpful by activating the display. Is there a way to disable that? Is there a way to fool Lion into thinking my lid is closed? I chose the bottom right because I keep my dock on the left hand side of my screen, and I use my upper right as a hot corner to sleep the display. I also moved the menu bar to my desktop monitor and the MacBook screen is completely dimmed. There was another option I heard about: using a magnet to make your MacBook think that the lid was closed. This does work - I placed a snippet of a refrigerator magnet near the bottom left side of my keyboard and sure enough my MacBook thought I had closed the display. Unfortunately, Mac OS X also disables keyboard and trackpad input when it thinks the display is closed, so this option didn't work for me. I know this is a bit of a kludge, but my work around for this issue is to hold down the brightness control on my macbook until the screen goes dark. Like you, I prefer to just work on the larger display, and keep typing with my laptop keyboard (with the laptop display open only partially and open just enough the I can use the laptop's keyboard). Anyway, this solution works for me. Re: "..and it's frustrating when my pointer disappears to the other screen.. "
Not sure if this works in Lion but if you have the lid closed and plug in a USB device it'll power up your monitor and then you can open the lid and your external monitor will be on and your lid will be off. First, I mirrored the displays, as has already been suggested. Soon after doing this, I realized that it was very distracting to have the macbook's lit screen off in the corner of my eye. This required that I kill the brightness on the macbook's screen. But being the lazy guy that I am, I hated having to manually adjust the brightness every time I un/plugged an external monitor. So I wondered if there was a way to automate the process. I found this free app called Control Plane which let's me set "contexts" based on whether certain devices (monitors, hard drives, etc) are plugged in, whether certain wi-fi networks are in range, etc; and based on these contexts, run certain shell scripts. So all I had to do was write an applescript (called killBrightness.scpt) to kill the brightness on the macbook's screen and a shell script to call killBrightness.scpt; and call this shell script in the required context. tell application "System Preferences" to set current pane to pane "Displays"
Now, all I had to do was write a similar shell script to call resizer.scpt and put that into ControlPlane and I was all set to be lazy all over again! 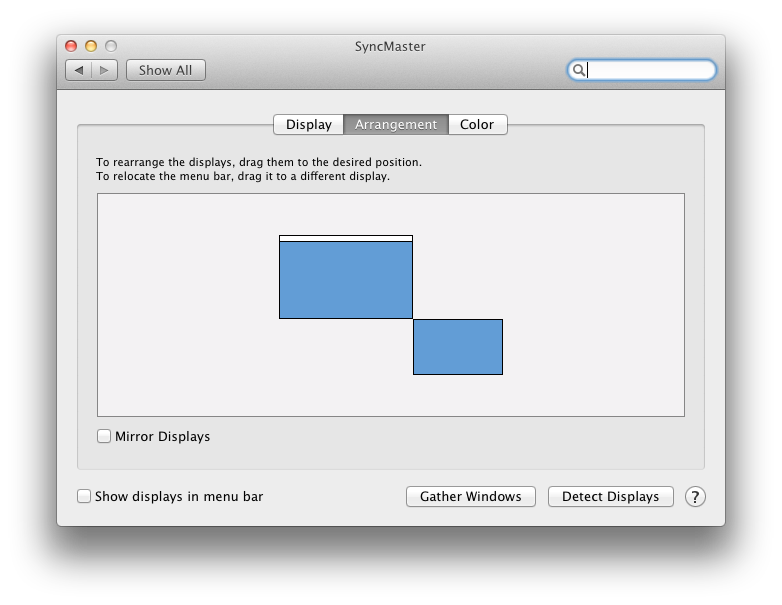 Just check the option "Mirror Displays" in Display Preferences. See below screenshot. Then turn down the Macbook's brightness to zero. This is a combination of a few of the other posts/comments here into one place. I'm using a MacBook Pro running El Capitan. drag the white menu bar from the macbook display to the external monitor (reference with screenshots). This makes the external monitor the Primary display. Arrange the blue boxes so that only the corners touch (screenshot provided by Kyle Cronin in posts above). This prevents the mouse from moving between screens. close the display options and tap the macbook's dimmer key (i.e. F1) until the screen is black. tap the brighten screen key on MacBook (i.e. F2). drag the white menu bar back to the macbook display. drag the blue boxes back into place. check the mirror displays option. This is how I achieve this. Connect You MacBook with the power cable (charger). Connect with external Keyboard + mouse. Turn the MacBook lid down. Now you are using only your external display, your cursor will not go into your other display. There is only one display now. Once you have hooked up the external monitor, for sometime you do see this extended monitor setup. But if you don't want to use the laptop screen, simply close the lid of the macbook pro and continue working on the larger screen this works. The laptop doesn't go into sleep mode. This is with the Lion release. Not the answer you're looking for? Browse other questions tagged lion display lid . How to fix a Macbook that does not always draw its internal screen after waking from sleep and having unplugged external display while asleep? 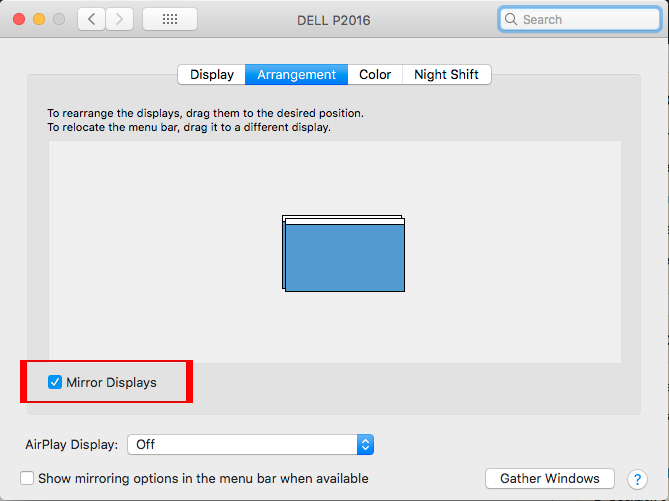 How to disable the Macbook internal display and only use the external display on Snow Leopard? Is there a way to turn off the rMBP display with an external monitor plugged in, without closing the lid? Restoring <= 10.6.8 lid-open Clamshell Mode in Mountain Lion? How to avoid external display going off after I unplug a MacBook from the AC Power?